BOSTON - The NBA is no different than any other professional league: Always looking for that next big star. While folks are loving what LeBron James, Steph Curry, James Harden and Russell Westbrook bring to the game, those guys aren't getting any younger as a new crop of talent enters the league annually. Here we take a look at some players, all 23 years old and younger, who have shown tremendous promise, the kind that will likely result in each being named to an All-Star team sooner rather than later. One of the youngest players when he entered the NBA, Booker has proven in very little time that he is one of the best pure scorers in the league. Last season, he averaged 24.9 points per game which ranked 10th in the NBA. And while he may miss some time early on due to surgery last month on his right hand. Of the players on this list, the 21-year-old Booker has to be at or near the top in terms of players likely to be named an all-star this season. When you combine the ability to score in the post, stretch the floor, pass and rebound, there are few in the same class of the 23-year-old Jokic. He was one of just four players to tally 10 or more triple-doubles last season. And of the quartet, the 7-foot Jokic was the only center among the bunch. It's hard to believe if he puts up similar numbers to what he did last season - 18.5 points, 10.7 rebounds, 6.1 assists and 1.2 steals while shooting 39.6 percent on 3's - prior to the all-star break, that he won't be named to the All-Star team this season. He was arguably the biggest surprise out of last season's rookie class, good enough to finish as runner-up in the Rookie of the Year race. But what really set Mitchell apart from most rookie that put up big numbers, was that he put up big numbers for a team that was winning. And while he certainly played a big role in that success, he seemed to find that happy medium between asserting control as the go-to guy, without ruffling the feathers of his teammates. He showed tremendous leadership skills at such a young age, that you know it's a matter of when - not if - he'll be named to an NBA all-star team after a rookie season in which he averaged 20.4 points, 3.7 rebounds and 3.7 assists while shooting 34 percent from 3-point range. Ben Simmons was very close to making an all-star team as a rookie last season before the 6-foot-10 point guard finished the season averaging a near triple-double of 15.8 points, 8.1 rebounds and 8.2 assists. With Philly's expected success this season and him being a prominent figure in them winning, Simmons will once again be in those conversations most of this season. The one thing we're all clamoring to see, is whether he has developed a perimeter game shooting the ball. Because he's extremely talented right now. If he adds that to the mix, he becomes damn near unstoppable. Although he was the third overall pick in last year's draft, the expectations weren't great for him early on because of Boston's depth. But there he was, in the starting lineup on opening night and has never looked back. 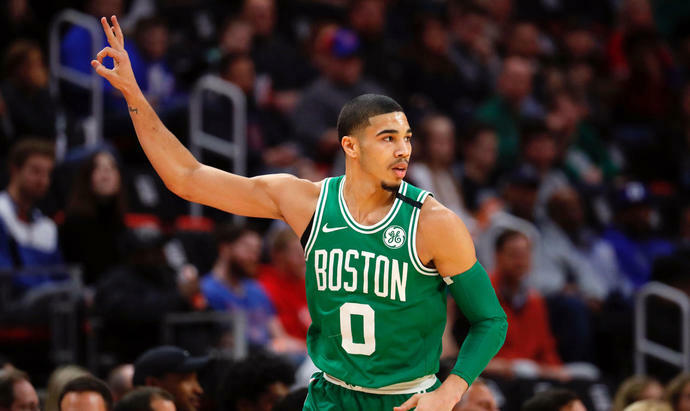 Tatum was solid during the regular season, showing flashes of being a dominant scorer whether it's off the dribble or from 3-point range where he shot better than 40 percent for the season. But in the playoffs, he became a different, more confident, more aggressive player. And talking to his teammates, they see a lot of that same "I got this fellas" in his game now. And while Kyrie Irving is the go-to guy on this team, Tatum is gradually separating himself from the pack as the next-best player in that regard. And when you're talking about a team that's likely to be among the leaders record-wise most of this season, it would not be a shocker if Tatum gets serious All-star consideration if the Celtics get off to a strong start and he establishes himself as one of the team's top two or three scorers.